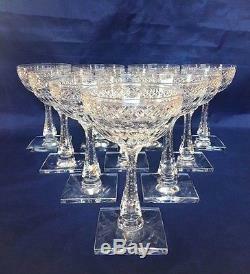 Hawkes & Company Cut Glass Champagne Glasses in Woodmere Pattern. 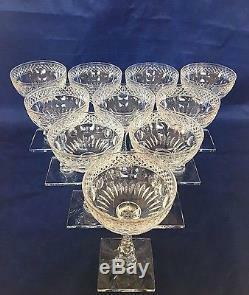 Offering a stunning set of ten (10) Cut Glass Champagne Glasses from T. Hawkes & Company of New York in the Woodmere pattern. The bowl is cut in the Woodmere pattern, the. Pattern #7240 and sits on a rectangular base. These beautiful glasses have an o. 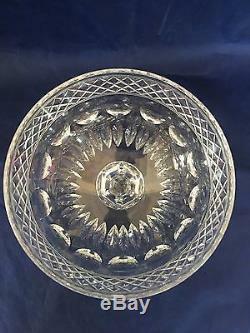 Void bowl with sheared rim, band of diamonds cut below rim, band of circles below that. Band of cut vertical facets around the base of bowl. The stem has an applied solid stem cut in 6 sides and facet-cut on edges and sits on an applied flat rectangular foot polished underneath. 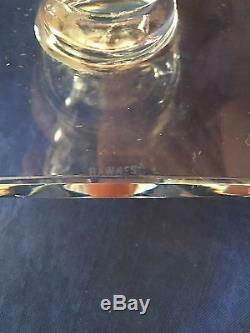 There is an acid-stamp "HAWKES" on top of the base. All are free of chips or cracks. An absolutely beautiful pattern and guaranteed to get compliments! The Hawkes Rich Cut Glass Works was established in 1880 in Corning, New York. In 1890, the firm was incorporated as T.
In its day, the Hawkes Company epitomized the finest in cut glass production, creating over 300 outstandingly beautiful cut and engraved stemware patterns and other pieces. The Hawkes Company was founded by Thomas Gibbons Hawkes, who migrated from Ireland at age 17. Thomas had studied civil engineering in school, but ended up in the glass business perhaps due to the pull of his ancestral ties. He descended from two families with generations of experience in the glass world: the Hawkes family of Dudley, England, and the Penrose family of Waterford, Ireland. 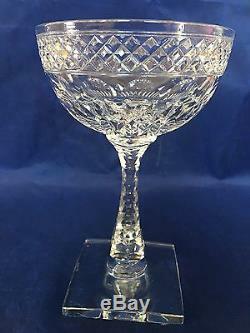 The Penrose name was linked to the founding of Waterford Glass. Thomas Hawkes of Dudley was reportedly the first person in England to make deeply cut glass. Prior to founding the Hawkes Company, Thomas was employed ten years as a foreman at the glass-cutting firm of Hoare & Dailey in Corning. When Thomas Hawkes died in 1913, his son, Samuel, who was already apprenticed in the glass trade, became President of the Hawkes Company, operating it successfully for thirty years. The company would remain a family-run enterprise until its closing in 1962. The firm's logo was a trefoil form enclosing a hawk in each of the two bottom lobes with a fleur-de-lis in the center. By 1920, only the acid-etched name HAWKES began to appear. About half the pieces are marked. During the early years of operation, the Hawkes Company obtained the majority of its blanks from the Steuben Glass Works, a Corning firm that Thomas Hawkes, Frederick Carder and others founded in 1903. Steuben was established mainly to make blanks for Hawkes, however, art glass, similar to the quality of Tiffany's, was also made there. A Collection of American Crystal A stemware Identification Guide for Glastonbury/Lotus, Libbey/rock Sharpe & Hawkes ; Greensboro, NC: Page/Frederiksen Publications; 1995. The item "T G Hawkes & Co. WOODMERE 7240 Cut Glass Champagne Glasses NY Signed Set of 10" is in sale since Sunday, February 05, 2017. This item is in the category "Pottery & Glass\Glass\Glassware\Contemporary Glass\Crystal". The seller is "emerald_eyes" and is located in Wheaton, Illinois. This item can be shipped to United States, Canada, United Kingdom, Denmark, Romania, Slovakia, Bulgaria, Czech republic, Finland, Hungary, Latvia, Lithuania, Malta, Estonia, Australia, Greece, Portugal, Cyprus, Slovenia, Japan, China, Sweden, South Korea, Indonesia, Taiwan, South africa, Thailand, Belgium, France, Hong Kong, Ireland, Netherlands, Poland, Spain, Italy, Germany, Austria, Russian federation, Israel, Mexico, New Zealand, Philippines, Singapore, Switzerland, Norway, Saudi arabia, Ukraine, United arab emirates, Qatar, Kuwait, Bahrain, Croatia, Malaysia, Brazil, Chile, Colombia, Costa rica, Panama, Trinidad and tobago, Guatemala, Honduras, Jamaica, Antigua and barbuda, Aruba, Belize, Dominica, Grenada, Saint kitts and nevis, Saint lucia, Montserrat, Turks and caicos islands, Barbados, Bangladesh, Bermuda, Brunei darussalam, Bolivia, Ecuador, Egypt, French guiana, Guernsey, Gibraltar, Guadeloupe, Iceland, Jersey, Jordan, Cambodia, Cayman islands, Liechtenstein, Sri lanka, Luxembourg, Monaco, Macao, Martinique, Maldives, Nicaragua, Oman, Peru, Pakistan, Paraguay, Reunion.